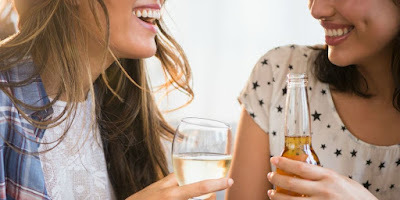 You've heard that a glass of wine a day can be good for your heart and your brain — while heavy alcohol consumption has long been linked to a greater risk of cancer including of the breast, oral, larynx, colon, and liver. (Why? Because over-imbibing can encourage abnormal growths in some organs.) But new research says that as little as a single drink a day may also boost your odds. Researchers at the Harvard T. H. Chan School of Public Health and Brigham and Women's Hospital recently reviewed studies that followed nearly 136,000 men and women for 30 years. Their results, reported in the BMJ, confirmed that people who drank more had a higher risk of alcohol-related cancers. But surprisingly, it doesn't take much: Consuming as little as one drink a day translated to a 13% higher risk of related cancers, especially breast cancer, in women. That's a glass of less than 15 grams — and included all forms of alcohol, fermented and distilled. The biggest takeaway, says Yin Cao, lead author of the study, is that the combination of smoking and alcohol could be a major contributor to cancer. "For men, especially those who ever smoked, they should limit alcohol to even below the recommended limit," she told Time. "And smoking and heavy alcohol consumption should be absolutely avoided to prevent cancer."